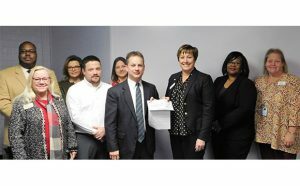 The $2,500 check was awarded at the January Principals’ End of Month Meeting. Shown accepting the check is Ms. Casey with Jonathan Ipock with Wells Fargo. Also pictured are, l-r, PIE board members, Ervin Patrick (past president), Darlene Brown (executive director), Sherri Thomas, William Byland, Lori Worley, with Mr. Ipock and Ms. Casey, and PIE board members, Dr. NeShawn Dawson and Debbie Hurst. In 2017, our local Wells Fargo representatives recognized the need for technology in Craven County Schools’ classroom, and together with Partners In Education, established the Wells Fargo Tech Grant. This grant seeks to engage our students using the most advanced technology available and demonstrates Wells Fargo’s commitment to improving the educational experience in our public school classrooms. If you would like to learn how your organization can make a difference through Craven County Schools’ local education foundation, PIE, contact Darlene Brown, Executive Director, at 514-6321.